In November, I was invited to present at the National Writing Project Annual Meeting. During my presentation I shared the Friday Institute's MOOC-Ed and micro-credentialing work with the goal of building the NWP partners' capacity to build scaleable professional development for educators. As a group we discussed what makes professional development work and the challenges in translating research-based best practices for PD into the online context through MOOC-Eds and micro-credentials. 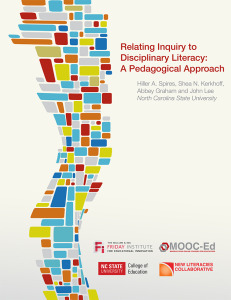 As a group we found that the potential to leverage online learning platforms for professional development for teachers and university faculty is great but it requires thoughtful decision making and design. As organizations it is important to consider our values and goals and use them thoughtfully to ensure that online learning experiences are valuable for teachers. As a part of NC State's efforts to create a nationally recognized hub of excellence in data science and analytics, the Data Science Initiative sponsored a Winter Symposium. The goals of this event were twofold: In addition to introducing the Initiative and hosting plenary talks on external partnerships and existing resources within the university, we hope to foster internal collaboration by using the afternoon to highlight existing research efforts across the university. This consisted of very short presentations by faculty members on individual research topics in a speed dating format, organized by college. As part of these faculty presentations, Dr. Shaun Kellogg discussed the integration of Learning Analytics techniques, including Data Dashboards and Social Network Analysis, to support more traditional evaluation approaches to online learning. Researchers from NC State and the Friday Institute for Educational Innovation discussed network analysis and visualization across a variety of disciplines, including education, sociology, and linguistics. Dr. Shaun Kellogg and Dr. Lauren Bryant, both research scholars at the Friday Institute, described how they have applied social network analysis and visualizations to study the impact of social network structures on the ultimate success of both online communities of practice and large, multi-institutional project teams. Dr. Steve McDonald, associate professor of sociology at NC State, demonstrated network visualization techniques used in his research on job mobility and labor market contacts. Dr. Robin Dodsworth, associate professor of linguistics at NC State, discussed her use of social network analysis and visualizations to research community network structures and their correlation with linguistic variation. 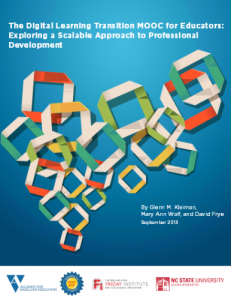 Click here to view the PowerPoint slides from a presentation made by Glenn Kleiman and Mary Ann Wolf at the UNESCO Mobile Learning Conference in Paris (Feb. 2014).